The Voyager first appeared in 1926, and to date 79 volumes are in print. There were, however, 7 years when it failed to appear: in the austerity years of 1933 and 1934 due to the Great Depression; and then in the 5 war related years from 1942-46. It is noteworthy that the earliest Voyagers, 1926-1931, were bi-annual, that is it was published twice a year. The collection below, as complete as can be presently mustered, is a result of collaboration between 3 related parties – Mrs. Lee (ACS Principal), Mr. Looi Teik Aun (Association) and Mr Hong Weng Kheun (Alumni). Mr. Hong donated his own 9 very hard to find volumes, those from 1931-41, a gracious act that has considerably strengthened the collection. 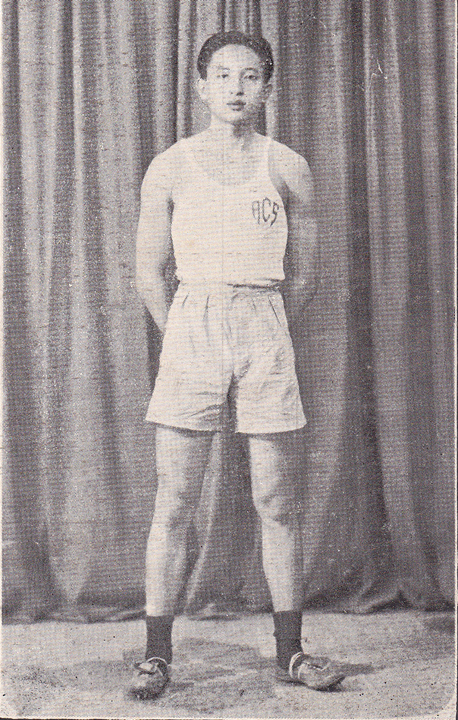 A young Mr. Hong (ACS Athletic Sports Champion 1940) appears in the 1941 Voyager . Another alumnus, Mr. Thavaratnam s/o S Kumarasamy, funded the collection’s professional binding and scanning services. The website committee wishes to express our grateful thanks to all of them. This collection, however, is not yet complete. There are still the missing twice a year publications of 1926, 1927, 1928 still to be accounted for in full, as is the one part of these volumes (1929, No. 1), (1930, No. 2) and (1931, No. 1). They are all important links to our school’s earlier history, and every endeavour will be made to secure them. Alumni or friends in possession, or knows of possible repository sources, are kindly urged to contact the Association towards this end. Click the particular year to download for viewing. “These files are 10MB in size or more and may take up several minutes to download”. I’m glad someone has taken the time to put some of the old magazines online. Most of my best childhood memories are of my school days, my teachers and the activities and teachings that have enriched my life. While books train our minds, the examples, disciplines and responsibilities instilled by dedicated teaching fraternity and the extra-curricular activities they so willingly give their time to are what has really prepared me for the school of life. I now call Australia home but I revisited the alma mater this January and had a good look around. The flashes of memories together with the echoes of the sounds and voices of my classmates and teachers really moved me. I never knew how much these classrooms and corridors were a part of me until then. Thankfully, my year has regular get-togethers and are from a generation where there was no shortage of old photos and other memory-joggers. Regrettably, I have lost all my old copies of the Voyager, some of which I helped edit in my final days at ACS so I look forward to seeing them reproduced here in future. If one’s existence is measured by the sum of his memories and those in whom his life has touched, then our annual school magazine and it’s contents is worth far more then mere ink on paper. Congratulation and a word of thanks to the group of alumnus who compile this collection of past issues of the Voyager. Brings back memories of those bygone days. I rember the primary school started their own one year (1960?). Is there any record of that? Wonder what happened after the inaugural issue??? Congrats to the management of the Alumni Association for their efforts and hard work in getting this site up and running. I studied in ACS Ipoh from 1966-1967. I stumbled on to this website and was amazed to discover a rich archive of historical documents that rekindle memories of my schooldays there. I shared the 1967 edition of the Voyager with some of my classmates recently and they eagerly devoured the pages bearing class photos of their classmates. It was nostalgic. Now I’ve shared this URL with them and I believe they will come online to learn more of their past through your esteem efforts. Thank you. Cogratulations on this fantastic, tedious and equally painstaking effort! It was like a dream to be able to ‘open-up’ and read the Voyager of yesteryears. The time and money spent on research is amplified in this well designed webpage. Once an ACSian, always an ACSian. The 13 years plus in ACS will always be among the best years of my life. I can even recite the names of each of my class teachers from Std 1 till F6. It was not just education and knowledge gained, but more so the experience earned that stands afresh in my memory. Prefects’ Board, Canteen Day, Swimming Gala, Annual Play, Library movie week, Temasya Sukan (where Oldham rules), and many-many more, the list is endless and not at all exhaustive. Looking forward, it is quite sad that children these days designate the school as a place to learn and just that. The involvement stops as the bell rings and school fields / courts are not filled with them running and playing. They rather return home as quick as they possibly can to spend time with the computer or technology related devices. I look forward to share this website with those from my era -the late 80′s and 90′s. Maybe more interesting materials and nostalgic memories can be crystallised and then shared with the fellow Ipoh ACSians out there. The ACS Ipoh school magazine is personified here as the good ship SS Voyager and represents the school’s journey for more than 11 decades. The SS Voyager set sailed in the 1895 carrying on board a handful of students (crew) and her inaugural Captain, Rev WE Horley. The journey over the last 110 years or more had been bountiful. Many young able bodied seamen had joined the Voyager and served their apprenticeship (gaining their “sea legs”) and became “old salts” who have settled in the nation and abroad. Looking at the Captain’s log book, Voyager had accumulated many chronicles and un-imaginable treasures in her cargo hold. As Voyager sailed, her banner unfurls and flapping vibrantly with the prevailing winds. Her reputation extended globally and now it is known throughout the world. It is amazing to read Voyager’s log book, particularly during the years when you first board the ship. At that time, you were too young to comprehend what is written in the log book nor would you understand the significance of the events that happened on board the ship. In reading the log book now, one would really appreciate the events that occurred annually and its consistency in terms of achievements and the pursuit of excellence in future careers of the crew. I am proud to have been a crew member of the good ship SS Voyager. A big thank you to those who laboured laboriously in restoring Voyager’s salt encrusted log book to a readable electronic form that can reach old salts globally. Crewman Pun Swee Leong, boarded in 1953 and disembarkation circa 1962. Good work. These Voyagers evoke happy memories of our youthful days spent in our alma mater. But we cannot dwell too much in the past. It is up to your committee to capitalise on the nostalgia evoked and make it relevant for the present and future. Mr Lee Thong Teck raised a pertinent question when he suggested to the committee to capitalise on the nostalgia evoked and make it relevant for the present and future. It is well accepted that an institution without a history has no future at all. In the case of ACS Ipoh, we had voluminous amount of history that can be considered factual, recollections, memoirs, sharing of experience and we should make most of it. The question Mr Lee raised should be directed to the school Principal in the first instance because it is the primary responsibility of the school. The Principal then enlists the Alumni committee to assist in the task. The Alumni is a repository of things past. Nostalgic recollections are in the realm of bonding, mateship and relationships (student-teacher). They can assist with character development of the student from the aged 6 -18. Stories of success and how old salts overcome barriers, hindrances and difficulties are case studies in the trial and tribulations of successful old salts. Their experience can be studied such that the developing student would not make the same mistakes. It will assist career selection and development. Hence, these examples are a good way of using the past to improve the present and build a successful future. We’re you from Menglembu during your school days? I remember the name from that era. Hi Pun Swee Leong (Leong Koo), this is Kok Wai (Wai Chai) fr.M’bu. coffee shop Trachell St. I just got this website recently and saw your articles.Do you remember we were in the same car back fr. school. Tai Tao Seng was car owner. We haven’t seen since you left for Aust.Mun Kit did mention about you in Sydney.How are you over there? He organized a get together dinner about 2 months ago with Fong Kee & bro. Yit Thong,Ah Kai, Sunny and Kam Kok etc.Bye. Congratulation to the Alumni Committe for the many painstalking experience to gather the many issues of VOYAGER. I believe it gave lot and lots of fond memories to many crew members aboard. Is there any issues of our junior crews on THE DAWN? It will be great to find more fondest memories there in those issues too. I am happy to see the copies of The Voyager available in soft copy. My late-father was in ACS Ipoh just before the war broke out. I am looking forward to trawling the old magazines to look for him!! When I entered ACS in ’80-’81, he was so excited. He said he was probably in the same class that I was sitting in, the ones behind the hall. Thank U, Alumni Committee, for a tremendous job done. I was in ACS from 1964 – 1969, could anyone of u post the THE DAWN on this site. Kudos to all. Good effort, thanks for archiving the memories. Congratulations to the people in the compilation of the “Voyager” dating back to 1926. Following the footsteps of my father and uncle, I was also a product of ACS Ipoh (1958) and I am proud of it. ACS Ipoh a premier school back then. My father was in Junior Cambridge in 1927 and sad to say the magazine was not available here; otherwise he would have been featured as a sportsman. However I am pleased to learn that my Uncle Ong Teng Choo had been very active in sports back in 1931. In 1929 (Voyager Page 18) it was mentioned that he gave a musical solo on the violin. Reading on the 1931 Voyager I learned that he was in the Inter-school track team, football team in his position as a left winger acknowledged for his capabilities to centres with both feet and was in the school badminton team. I truly proud of his achievements. In his footsteps I was also in the school badminton team 1957-1958. So you see I was in his following in my own way. An outstanding effort which allowed to reminiscence the good old days of ACS. Swee Leong (leong ku) this is Kok Wai ( wai chai) staying in M’bu. Tranchell St. coffee shop. It’s been a long time since we have seen.How are you in Sydney? Mun Kit did mention about you. About 3months ago he organized a get together dinner with Fong Kee & bro. Yit Thong,Ah Kai, Sunny and Kam Kok etc.I don’t know you remember Kam Kok or not. I only got the acs alumni website few day ago and saw your articles dated 3 years back.Bye for now. Kudos to those who have made the Voyager accessible to all seating in various corners of the world. It is an absolute delight to recall the 13 years spent in the school from the days of the attap roof in primary 1 (1958)to enjoying the company of the pretty lassies from MGS in the 6th form(’69 n ’70). We are glad that you enjoy the posting of our Voyager series on the Alumni Website. We welcome you into the fraternity and hope that you would sign up as a life member of our Alumni Association. Do join our Alumni Dinner on Saturday, 6th August this year as well as attend the Charity Concert the night before. What you have done here with the website is brilliant. My father, Yap Yit Poh, died in February this year. He went to ACS, and finished in the class of 1949. He went on to graduate as a medical doctor from Sydney University in 1959. I am doing some research into my family tree and reading these publications has provided a wonderful insight into school life at the time. Here is a link to a photo on his graduation day at Sydney University held in the National Archives of Australia. So glad to have tracked down my old school magazine eventually but I cannot find any of my former classmates (I left in Aug 1969) in Form 6 Science A.